Brazilian, Joana Schmitz Croxato, and her husband discovered when she was 12-weeks pregnant that their baby had acrania and was considered 'incompatible with extra uterine life'. "When I completed 12 weeks into my pregnancy, my husband and I found out that our very expected first baby had a very serious problem called acrania. Our baby did not have her cranium formed, and without a bone structure and scalp on her head, her brain would be exposed and would be damaged being in contact with the amniotic fluid, causing anencephaly. We were informed this kind of malformation is incompatible with life, and that our baby would die right after being born, so we could seek in court the right to interrupt my pregnancy. If we decided to continue, there would not be any guarantee that my pregnancy would even reach the expected 38 weeks: my baby could maybe not resist and I, the mother, could face some difficulties such as excess amniotic fluid and a complicated delivery. 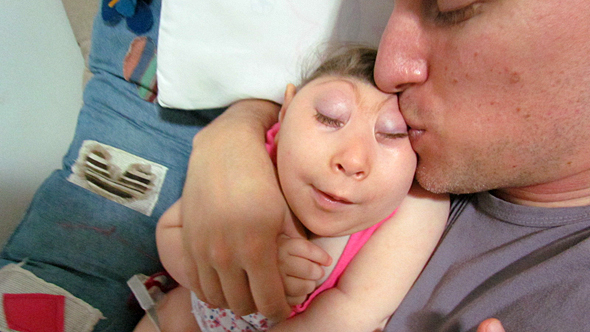 Keeping our baby was not functional, and death was inevitable, sooner or later, so we heard." 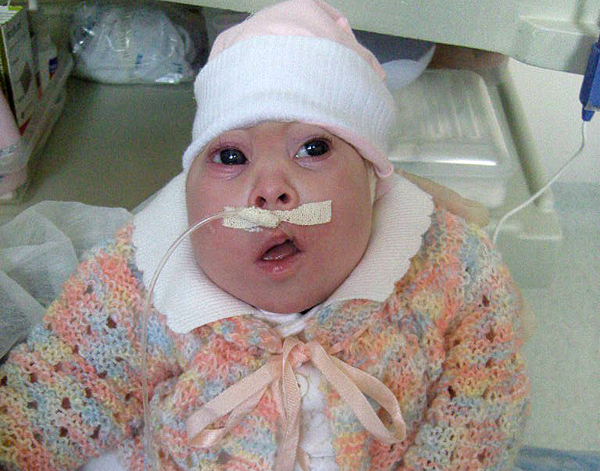 "Despite being aware of the gravity of this situation, we decided to believe that God could change our baby's death sentence and give us the miracle of curing her, allowing her to survive after her birth. As long as our baby was alive, we would ask God for a miracle everyday, and we would let our baby know she was very loved and welcome. We soon found out "it" was a girl, and we chose to call her Vitoria de Cristo (Victory of Christ). Through our faith in Christ, we decided not to grieve in advance. While there was life, we would celebrate it - that was our thought. We decided to love our baby the same way we have been loved by God, individually, personally, and unconditionally, without rejection, without fear, never giving up. Amidst many prayers and tears, we lived moments of great joy during my pregnancy, seeing our little daughter grow and start to move and kick my belly everyday, answering to our voice and touch. 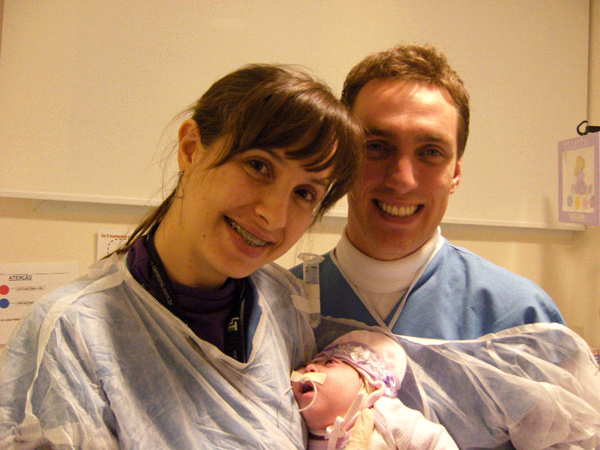 On January 13, 2010, our beloved daughter was born by C-section, with 38 weeks of pregnancy, weighing 1,785kg and measuring 38cm, and was taken to the NICU. Going against all death sentences, what we saw was a child full of life, calm and pretty, and we were amazed by God and thankful to Him for the privilege of meeting our daughter, of carrying her in our arms, and of spending unforgettable moments with her. 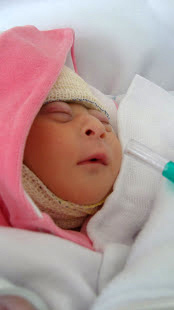 After four months at the hospital there was the possibility of a surgery to reconstruct her cranium. She was healthy and strong enough, but infections still were a big problem for her. It was a very difficult decision because we never wanted her to suffer. 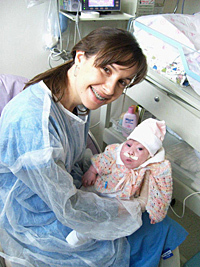 But we decided for the surgery in order to offer her more quality of life, and the surgery successfully took place on May 19, 2010. 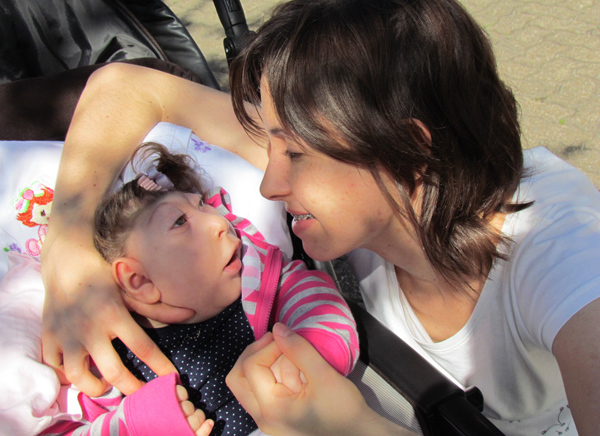 One month after that, Vitoria was finally released from the hospital and went home, healthy, breathing by herself, without the need of a feeding-tube, and full of life! Living with Vitoria's presence has been a great joy. I am a mother and have a baby to love and care for. My daughter has made me rethink many things. Why do we have children? Before she was born, I had many answers to this question, but nowadays, not so many. Nevertheless, I feel this great joy and desire to be a mother. Before Vitoria, I thought I wanted a child to see her grow, help her develop and become a healthy, happy adult, someone with confidence and high values. 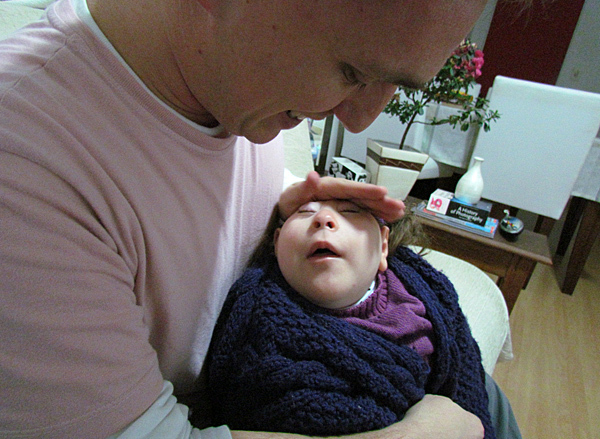 I wanted to teach my child to love God and help others, and also to give me happiness during my elder years. Will I live all these moments with Vitoria? I don't know. The doctors say I won't. Many friends and relatives also think I won't. I myself think that maybe I won't. However, I do not have many certainties in this life anymore. I no longer feel anxious about the future. Honestly, the future does not concern me now. Vitoria's future isn't the most important thing right now. Her present is. And her present, despite its fragility, brings me much joy. It brings me life. Her present is so relevant, so important. It is strange. This child, who received so many death sentences, whose death was and still is expected by doctors, relatives, friends, this child only brings me life. I had never felt so alive and happy like I did during my pregnancy. So free. Despite the fact that I had some sad and uncertain moments. Vitoria brought me strength to live, to fight, to be happy against all odds. My daughter taught me to see God like a real father, who takes care of me, and to whom I can cry for help and, then, rest. Vitoria taught me to trust. To really trust, without doubts. Without objections. Going back to the initial question, why do we have children? Right now I do not know if I'll be able to experience certain moments with my daughter. Right now all I have is the present time. I cannot talk about her future and the expectations I have for her, like parents usually do. I do not feel frustrated or unhappy as a mother, though. The only thing I can think of is that I want to have my daughter to love her; to learn how to love; to get to know her and make her feel loved; very much loved. I think we have children so that we can love. Late July 2012, one Sunday we played in the living room floor and I did a pretty braid in her hair. On Monday it was very cold, she was sleeping peaceful. I spent a long time in the afternoon with her in my lap, she was hugged to me while I warmed her next to my body. At night she slept in the lap of dad and Grandma Cida. I put her to sleep tummy down, and left the heater on because she was cold, with 35.2 ° C. Until 1:30 am I watched her in the crib, she slept quiet, had even dropped the pacifier. Quarter to six in the morning the Lord woke her up saying her time with us had finished, that she should go... but He let she tell us she was leaving and say goodbye to us. She had high fever, 40 C, and we took her to the hospital where she arrived already going into shock. But there was not a focus of infection, her lungs were clear, the urine unchanged, the abdomen was normal, around all her little body it was not found the focus of infection. But she was having a devastating septic shock, an overwhelming infection, perhaps in the blood, perhaps due to many recurrent infections and prolonged use of antibiotics. For an intraosseous access she received much serum. She was intubated, a central catheter was passed and doctors started drugs to raise her pressure and strengthen her heart, and antibiotics. But there were no answers, instead of rising her pressure dropped and the kidneys stopped working. Unlike other times, when she struggled, fought, resisted and reacted, this time she remained quiet and with no answers. She seemed to be saying that now she would rest from all her fight and her mission. Once the doctor told us at the end of the day, the immense gravity of her condition, we prayed that everything could be reversed and she could be healed and be fine again. However she remained the same. Then we cried to the Lord that she did not suffer more, if it was time to take her, we wanted her to go in peace and without pain. I begged God that if she was to suffer, that I would instead of her. So in a few minutes her heart rate began to decline. Like a sunset, her heart was sinking softly as she was hugged and kissed. As the last notes of a symphony, the most beautiful song I've ever had the privilege of hearing all my life, this silent music that she delivered during every second of her life with us. Even intubated she gave her last two breaths and flew to Jesus, in peace... And let us lulling for this sweet song that was have loved her deeply, with all our hearts, with all our physical, spiritual, emotional and intellectual strengths, in joy and in sorrow, in good and bad days, for all her life, from conception to birth, from birth to death. This strong love that I learned and realized I could feel just accepting and receiving her in my life, will forever be with me and guide me in all my days - a love that took me closer to God´s heart. What am I going to do now? What will I make of my days, from waking up to lie down, if in the last three years I devoted every day of my life for this princess who I had the privilege of being mother? I don´t know, I just know that I want to be a respondent to the daughter I had. There is so much to do. She rested from her mission, but we are still fulfilling our, which will always be closely linked to her, to her memory, to the priceless gift of life, to the inviolable right that is to live as long as one has to live with love and dignity."